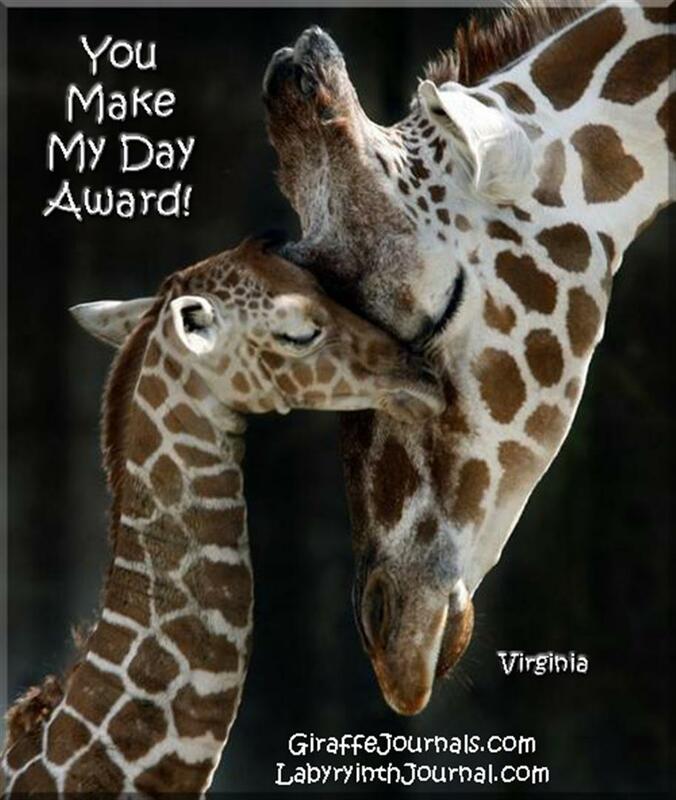 I appreciate the warm welcome I’ve received here at my Giraffe Journal, and am sharing a bit more today. I’m delighted by the new, recent & long-time (somehow the word ‘old’ doesn’t feel right) friends my wilderness playground has attracted and I feel supported richly by your comments thus far. Thank you so much for your kindness, encouragement, and enthusiasm. It feels a bit scary to be my authentic self with no ‘pseudonym’ as a buffer … sharing truth as I understand it … revealing the meandering words from my journal pages without ‘editing’ them at all. Yet that’s what I intend to do when publishing my first book, so ‘practice’ makes sense. Just so you know … allowing myself to take in & experience approval isn’t easy because I’m a ‘recovering perfectionist’ which means nothing I do ever seems quite good enough to me. Luna Jaffe, one of my Taos roommates who is starting her own business currently … (I have no link yet but you can her see logo below)… noticed this about me and encouraged me to respond to feedback with the phrase, ‘Thank you, I’m glad you noticed!” I’ve been practicing so this response becomes easier each day. Filled with appreciation, I left responses to each comment on my previous posts as I found them because I’d like this blog to evolve into a conversation if at all possible. In addition I sent email responses just to be sure the messages were received. There is a way to subscribe through an RSS Feed to both ‘entries’ and ‘comments’ near the bottom of my sidebar in the section labeled ‘Meta’ if you wish to do so. I’m new to ‘self-hosting’ with lots to learn about how things work here at WordPress (even though I’ve used the free WP platform for a while now). There are things I could do at Happily Retired Gal that I can’t do here, and vice versa … so it’s puzzling at the moment. I hope you’ll bear with me as I muddle through … figuring things out as I go. Apparently the way things work currently is that a first comment from each visitor gets sent to an email address for ‘moderation’ … but once it’s been approved and published, future comments from that person should show up right away. A current ‘glitch’ for me is that comments from this blog are directed to an email associated with a ‘domain’ that’s not yet been activated. Although I’ve tried just about everything I can think of, I’ve not been able to figure out how to change that … so I’ve added the question to a growing list for my next call to GoDaddy tech support. I suspect it will get cleared up eventually, but in the meantime there may be some lag time between the time comments are left by new visitors and when they’re approved. This morning upon awakening, I realized I’d neglected to add ‘Thoughts for the Day’ at the end of my first two entries. Doing so is a practice carried over from my years in the classroom and something I did on each of my previous blogs, so I’ve taken the liberty to add quotes to those posts this morning … just because. I plan to continue passing along bits of collected ‘wisdom’ at the end of each entry from now on and invite you to share your own thoughts and meaningful ‘quotes’ as you leave responses. I’ve been thinking of my mom today as I’ve done several loads of laundry and a few other chores around the house. Having neglected these tasks in favor of blogging lately, I’m feeling a wee bit guilty though I often choose to release worry and guilt these days (after cultivating this new habit over time) so I’m not likely to lose any sleep over it. I’ve enjoyed learning to do new things, meeting new people through their blogs, experimenting with sharing previous writings from my journals, discovering comments, and responding from the heart. Some days I spend more time at the computer than I’d care to admit. My life is so much easier than hers. She never worked outside the home because my Dad didn’t want her too, and she did have three kids to raise once I appeared on the scene. Mom always did laundry on Mondays, and we kids would help her hang the clothes on the outdoor lines to dry. Rainy Mondays always threw her off because she had specific days to do different tasks. Tuesday was for ironing, but I don’t recall which specific tasks she assigned to other days. She cleaned, baked, mended, sewed our clothes, darned socks, cooked meals, and volunteered at our schools & at church. We’d sit on the back porch together to shell peas, but Mom didn’t let either my sister nor I help with cooking. We did take turns drying the dishes after dinner as she washed them carefully … never trusting us with that task either. Occasionally she visited over the fence with neighbors, but for the most part was busy all the time taking care of the family. My mother loved to play the old upright piano in our living room, and we often gathered around to listen and/or sing along. Later in life after all 3 of us kids were married and my had Dad died, she purchased a new piano and and large organ with multiple keyboards, stops, and foot pedals … setting them up like Liberace and Corla Panda at right angles to one another so she could play each simply by turning on the stool. She watched them faithfully on television when we were kids, and took lessons as a senior citizen … acquiring new skills with regular practice. Possibly the time I’m spending at my computer is similar to the time Mom devoted to mastering musical skill, once she had the time to pursue that interest for pleasure. I suspect she’d wholeheartedly approve of me sharing my writing on these two blogs as she shared her music joyfully. Reading through this piece now, you’d never suspect what difficulties we encountered with one another, but ours was a complex relationship that changed significantly over time as I suspect is common with many mothers and daughters. I’d like to continue sharing memories of mom, but methinks I’ll stop here for now and share more tomorrow because this post is quite long already, it’s almost 10am … Molly needs a walk (so do I) … and I have things to accomplish today. Someone told me recently that it’s good to stop writing in the middle of a story because the mind will play with it and you’ll return to the page and pick up where you left off more easily. I hope that’s true because that’s what I plan to do in my next post. As I wrote previously, please feel free to stick your neck out and leave comments below. Share your reactions to this post & new site … your own ‘aha’ moments and/or pivotal life stories. I’m eager to meet you and want make Giraffe Journal safe space for interaction. In future posts, I’ll continue with my own stories and add more of my ‘convoluted writings’ … scanned from the pages of my journal … once I get the printer & laptop communicating again. Thanks for visiting. I hope you’ll return soon … and often. This entry was posted in invitations, mom, stories and tagged risks, technical issues. Bookmark the permalink. Congrats Virginia on this new blog! I’m excited about all your new explorations and possibilities. Just the other day I pulled a giraffe photo out of my stock pile of clipped magazines images. I thought this will be the perfect background to use when I make a community SoulCollage® card about Virginia for my deck. That giraffe photo was actually sticking it’s neck down and inside a house looking at a little girl through a doorway. I’m wishing you much enjoyment as this new path unfolds for you! What FUN to find your comment just now. I appreciate your visit and your enthusiastic good wishes for my new play space. How kewl that you’re adding a card to your deck with me in mind. The picture sounds fascinating and perfect! I hope you’ll scan or photograph it when it’s finished and send me a copy. Lots is happening quickly in my life these days so I’m busier than I’ve been in at least a decade. I’m trying to relax and have fun with all that’s unfolding, but occasionally anxiety grips me and fear creeps in … until I remind myself to breathe and remember that all’s well. I’ve invested more money in myself during the last two months than I’ve spent in a long while, but methinks ’tis all for good … that these are investments in a bright future.